There’s no denying the G5420T is a gorgeous instrument with a severe case of nostalgia, drawing inspiration from so many hollow body guitars of yesteryear. One of the first things that will catch your eye is the color and there are three striking varieties to choose from – Orange Satin, Fairlane Blue, and Aspen Green. Despite being mass-produced in Korea, the fit and finish of each of these is great for the sub-$1000 price tag and actually feels like an instrument twice its price. Looking at the construction itself, the G5420T has a single-cutaway hollow body made of laminated maple, complete with oversized bound f-holes, silver pickguard with the iconic Gretsch logo, aged white binding and a thin black and white purfling. It’s a simple yet stylish look which continues up into the neck and headstock. With a 24.6” scale length, the neck is made of maple with a glossy finish, a rosewood fretboard and 22 medium jumbo frets with offset pearloid thumbnail inlays. It plays very well, although feels in need of a bit of a setup out of the box to help it reach its potential. The G5420T is loaded with some quality hardware for the price. Starting with the electronics, the guitar is fitted with two Blacktop Filter’Tron humbuckers at the bridge and neck positions. These are tended to by an individual volume control for each, along with a single master tone control to offer decent onboard sound shaping – not forgetting the three-way pickup selector switch. Sitting on the late-50s headstock is a set of unbranded open-gear vintage-style tuning machines, which are nothing spectacular but do their job and hold your tuning quite well. At the other end, you’ll find one of the most notable hardware additions in the Bigsby Adjusto-Matic tremolo bridge, which feels sturdy and functions nicely. There is plenty on offer in the sound department too, with the G5420T offering the classic tone you’d want from a Gretsch. The Filter’Tron humbuckers deliver a plethora of vintage-soaked voices ranging from punchy clear tones and warm jazzy sounds, right up to a good overdriven growl for heavier styles. Too much more than classic rock may be pushing this guitar a bit, but it can cope with pretty much anything thrown at it. You only have to spend a little bit of time with this handsome hollow body to feel its worth. It’s not perfect, but for players just making the move to hollow body guitars, or those wanting a good-looking second model that really pops on stage, the G5420T will do the trick. 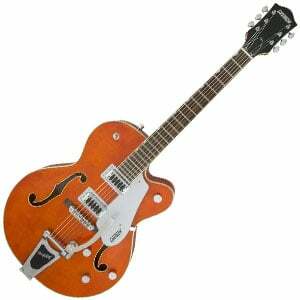 More info about the Gretsch G5420T , click here. For more Hollow Body Guitars On The Market , click here. I bought one just on looks. Best impulse buy ever. I highly recommend it. Its beautiful looking too. Great Guitar, I have the fairline Blue version, the tuners however although they would appear to be an 18/1 ratio are not that accurate on my guitar. The problem is changing them for something else as there is not much out there unless you get the drill out & that for me is a NO NO.